After Nazi Germany’s defeat, Marianne von Lingenfels returns as a widow to the castle of her husband’s ancestors, now fallen into ruin after long years of war. Along the way, she follows through on a promise she made to her husband and others of the resistance: to find and protect their wives, also widows like herself. Marianne first rescues six-year-old Martin, the son of a resister, from a Nazi reeducation home. Together they make their way across war-torn Germany to Berlin, where they rescue Martin’s mother, Benita, from life as a prostitute to the Red Army. Then Marianne locates Ania, another resister’s wife, and her two boys, now refugees in one of the many displacement camps around the country. As Marianne tries to create a family from the survivors of her husband’s resistance movement, she is certain their shared pain and circumstances will hold them together. But she quickly discovers that their previous lives, plus events that continue to bombard them as the country recovers, have complicated their perceptions with dark secrets that threaten to tear them apart. Eventually all three women must come to terms with the choices that they made before, during, and after the war – each with her own unique set of challenges. 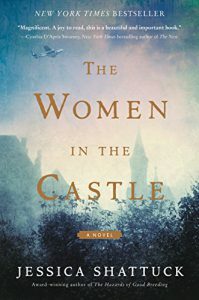 If you enjoyed reading The Nightingale, Sarah’s Key, or The Light Between Oceans, you will definitely enjoy The Women in the Castle, by Jessica Shattuck. This entry was posted in Books & Reading, General, Information Resources, Programming, Uncategorized and tagged Friday Reads. Bookmark the permalink. ← Throwback Thursday: Hotel Fontenelle, Omaha, Nebr.